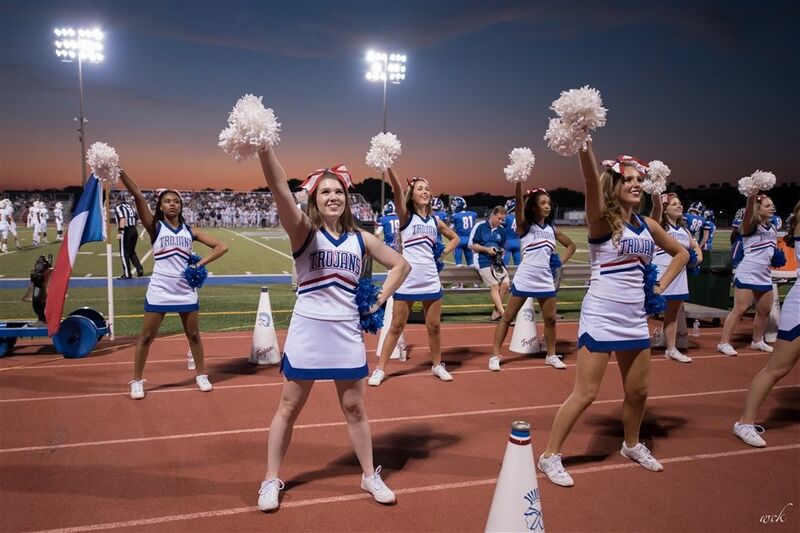 After interviewing several girls on the Varsity cheer team at TCA, I have come to acknowledge cheerleading as a demanding sport and an important and beneficial way to connect to the school as a whole. What is cheerleading? Many people claim that cheerleading is simply the entertainment at a football game. While others believe that cheer is only a couple of girls waving pom-poms and smiling. After interviewing several girls on the Varsity cheer team at TCA, I have come to acknowledge cheerleading as a demanding sport and an important and beneficial way to connect to the school as a whole. Through interviewing a few members of the Varsity cheer squad, I learned about the time that the team spends preparing for pep rallies and competitions. With numerous early morning and after school practices, the Varsity cheer team not only gives a gigantic block of their time to the sport but also practices with diligence. Cheerleading takes dedication and team work just like any other sport. During their practices, the group constantly learns new cheers and runs through previously learned routines. Unlike other team sports, not only do the girls have to practice in preparation to perform for the pep rallies, games, and competitions, but they also have to remain in complete synchronization throughout all of their dances and cheers. For pep rallies, which are normally held before a largely anticipated Varsity football game, the team decorates the halls of the Upper school with posters that they create themselves. Even if the high school does not respond with as much enthusiasm during their routines, the cheerleaders must keep smiling and perform with the same vigorous determination as before. Despite rain showers and summer heat, Varsity cheer continued to encourage the Trojan football players. Cheer requires almost as much grit as football, the sport that they ordinarily support, because they similarly have to maintain optimism even in the face of failure. For the TAPPS competition, one of the only times of the year in which the cheerleaders compete against other squads, the group of cheerleaders travel to Waco, Texas to compete, In preparation for this event, the team stayed and practiced their routine at school until midnight one night during the season. While at the competition, the team performed two routines for the judges. To the surprise and excitement of the team, the girls came in 1st place at the competition this year. Afterwards, Alexis Everett, a junior member of the team, disclosed that the atmosphere of the competition was “very rowdy” and “competitive” but a “super fun” experience to have been a part of. Like any family, varsity cheer has persevered through ups and downs this season and have become genuine friends with each other. I mean…it’s rather difficult to get through many football games and practices if you do not enjoy the presence of those around you. As well as functioning as a rigorous sport, cheer brings the girls together as a team. Pairing first year Varsity Cheer members with a second year member, the first year girls gain a cheer “Big Sis”. Jordan Jones, a junior and first year member of Varsity Cheer, claimed that “[having a “Big Sis”] is a fun initiation thing” and that the program provides “someone to get advice from and learn how Varsity works”, as well as gaining “an older friend”. Numerous girls say that the best and their favorite part of cheer is the group of girls that they are able to hang out with and get to know through the experience. Through challenging competitions and strenuous practices, the Varsity cheer team works extremely hard and reaps positive results through their labor, as well as creates bonds between the girls on the team.